Chancellor Ronnie Green delivered the 2017 State of the University address on Sept. 19, mapping out university initiatives for the year ahead. As the University of Nebraska-Lincoln closes in on its 150th birthday, Chancellor Ronnie Green said the institution must initiate “bold transformation” to sustain the energy and growth that has signified this era in the university’s history. The chancellor, who addressed faculty, staff, students, alumni and other university stakeholders Sept. 19 at his second State of the University address, said that a range of challenges – budgetary and otherwise – can and will be overcome as Nebraska remains on course toward becoming a distinctive Big Ten university. Green leveraged his annual speech at the Lied Center for Performing Arts to ask those in attendance and others watching online to consider the year ahead for the university. “While we have experienced a tremendous amount of momentum in the past several years, we do have some significant challenges in maintaining that momentum and accelerating ahead in to the future,” he said. Those tests include constrained budgetary resources; continued evolution of the university’s funding portfolio; more challenging economic conditions for students and the need for cost containment; increasing mental health needs of the university community, particularly students; and challenges associated with understanding and maintaining respectful discourse while fully adhering to freedom of speech and the ideals of academic freedom. “In light of these important externalities, there is no doubt that we need what I will refer to as ‘bold transformation’ as we lean forward into our next era,” the chancellor said. On the budget, Green said the university faces a state deficit of $17 million for the current biennium – about $6 million in the current fiscal year and an additional $11 million in the 2019 fiscal year. The state’s fiscal challenges brought about systemwide Budget Response Teams that identified ways to streamline, consolidate and find budget efficiencies across 10 areas of business services. Their recommendations were projected to eventually recoup more than $30 million across the system, with $22 million identified as possible in the current biennium. The savings gained through the budget-response process, projected to be $11.3 million for the University of Nebraska-Lincoln out of the total of $22 million across the university system, will affect all units at Nebraska, Green said. “While this will be painful in the short term, it is the right thing to do in the long term for the university,” he said. That also leaves an additional minimum of about $6 million in cuts and reallocations to close the budget gap. Green said he would meet with the university’s Academic Planning Committee on Sept. 20 to lay out the general framework to begin the budget planning process as defined by university policy. To assure that the university has some reinvestment ability and to offer contingency against additional potential cuts, Green said he will ask the APC to work with his administration to consider $8.5 million in programmatic cuts and reallocations – about $6 million in shortfall plus 1 percent of the state appropriation base. The budgeting process should be completed around the beginning of the spring 2018 semester to allow time to make any necessary changes going into the next fiscal year. As a precautionary measure, the university also has held back 2 percent of its state appropriations in Academic Affairs and the Institute of Agriculture and Natural Resources if additional cuts are needed. Following last year’s work by a university-wide task force on budget models, the administration is evaluating different approaches to future budgets, Green said. The chancellor said he would work with the group this fall to model the optimal approach to revamping the budget model across the university, including elimination of administrative fee structures and revision of the indirect costs allocation model for facilities and administrative costs. “While we must, and will, successfully manage through the fiscal challenge, we must equally importantly continue in our planning and progress for the university,” the chancellor said. As the result of a separate task force on academic distinction, Green said he would commission an evaluation of the university’s academic organizational effectiveness in the life sciences. The life sciences at Nebraska has experienced several major external and internal reviews and consultations since the late 1990s, Green said, and all have called for, in differing ways, consideration of reorganization of the university’s efforts in that area. While the chancellor said there “has been significant change — and progress – in our life sciences efforts during that time period,” because of the critical magnitude of our investments and strategic focus in this area, he will appoint a faculty-led task force to consider organizational optimization and needs of the life sciences at Nebraska, including in relation to partnership and collaboration as appropriate with the University of Nebraska Medical Center. 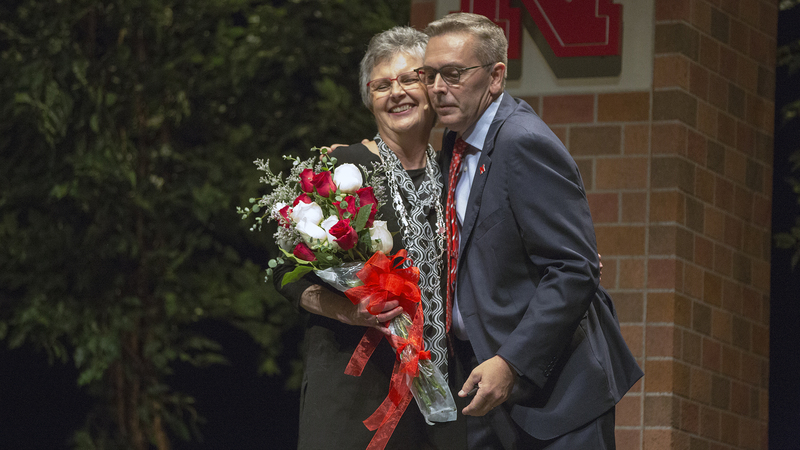 Chancellor Ronnie Green congratulates Chris Jackson for her 17 years of service as Nebraska's vice chancellor for business and finance. Jackson has announced plans to retire in December. -- An update on the university’s diversity and inclusion efforts. A “careful, pragmatic” mapping of the university for its diversity and inclusion efforts has now been completed and reported by Rona Halualani of Halualani and Associates. The final draft report has been shared with the Diversity Council, deans and other leaders and is available here. The report notes the many, if not necessarily coordinated or strategic, diversity initiatives at Nebraska, and calls for an Office of Diversity and Inclusion Excellence led by a vice chancellor reporting to Executive Vice Chancellor Donde Plowman. This office will seek to increase recruitment, retention and graduation of minority students; increase recruitment, retention and promotion of minority faculty and staff; provide support for inclusion and excellence in curricular and co-curricular programs; and communicate expectations and norms that demonstrate the university’s commitment for diversity and inclusion. -- A nod to a year of leadership in transition – Plowman becoming executive vice chancellor and chief academic officer; and several changes in the Office of the Executive Vice Chancellor: Amy Goodburn becoming senior associate vice chancellor and dean of undergraduate education; Judy Walker becoming associate vice chancellor for faculty affairs; Sonia Feigenbaum becoming associate vice chancellor for international engagement and global strategies and senior international officer; James Volkmer becoming assistant vice chancellor of budget planning and analytics; Amber Williams becoming assistant vice chancellor for academic services and enrollment management; Renee Batman becoming assistant vice chancellor and chief Administrative officer. Mike Boehm becoming the univerity’s new Harlan Vice Chancellor of IANR; Steve Goddard stepping in for the late Prem Paul as interim vice chancellor for research and economic development; Laurie Bellows becoming interim vice chancellor for student affairs; Tim Carr becoming interim dean of graduate studies; Richard Moberly becoming the permanent dean of the College of Law; Beth Doll assuming the role of interim dean of the College of Education and Human Sciences; Tiffany Heng-Moss becoming interim dean of the College of Agricultural Sciences and Natural Resources; and Kathy Farrell stepping into the role of interim dean of the College of Business. -- A tribute to the late Juan Franco, vice chancellor for student affairs from 2006-17, who passed away suddenly in August. -- A note about the fall 2017 enrollment of 26,079 being the largest ever at Nebraska – the third year in a row for record enrollment and the fifth straight year of enrollment growth overall. -- The results of a strategic report on smart enrollment growth. The group evaluated the competitive marketplace in which Nebraska operates, institutions that have significantly increased enrollment in a similar way in the past decade, and where the greatest opportunities exist for needed growth at Nebraska. The group’s recommendation that a reasonable goal for total enrollment by 2025 is about 29,000 to 31,000 students, with an aspirational goal of 32,500. “Achievement of this level of enrollment will require us to innovate in a number of ways, including increasing levels of financial support for students, maximizing the capacity of our academic and university housing infrastructure, expanding and innovating our university honors program, and concomitantly investing in our faculty ranks to meet the anticipated growth,” the chancellor said. Green concluded by reinforcing his view of “how critically important our planning and focus in this year ahead will be to the immediate and long-term future of Nebraska’s flagship university. “While there is a huge amount of activity requiring a huge amount of work for all of us, I want (to focus us) all back on our mission -- delivering the highest quality education to our students, pushing the frontiers with world-leading research, creative activity and discovery, and engaging with our state in ways that improve the human and natural conditions of this place called Nebraska, all the while treating each other with dignity, respect, collegiality and care – even if, and when, we might disagree. 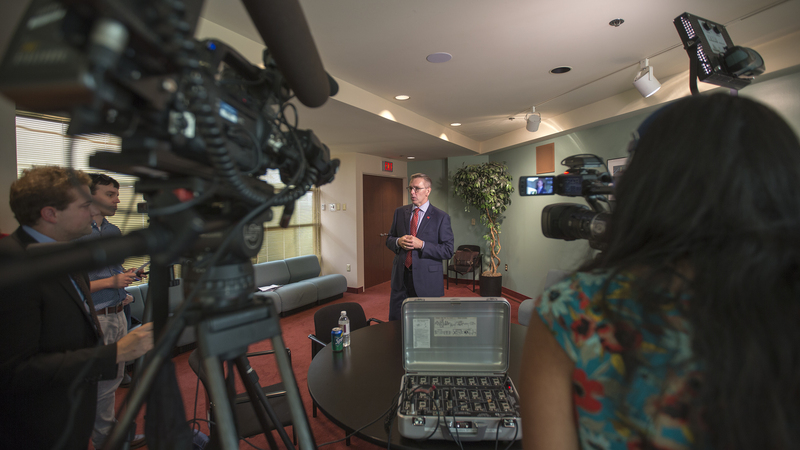 Chancellor Ronnie Green talks to media following the Sept. 19 State of the University address.